March is generally the starting month for early research master internships. My research group (statistical learning and networks) is welcoming this year one intern, Charles-Abner Dadi, who joined us on the first of March. Charles is a former student of our MASS curricula (mathematics applied to social sciences). He is currently following two M2 (second year of the master), the MVA Master at ENS Cachan and the Stochastic Modeling Master (a joint master between Paris 1 and Paris 7). Charles is joining Pierre Latouche and myself on a joint work about temporal graphs. We have been recently working on the following setting. Assume that one observes interactions between actors on a long time period. Each interaction is timestamped with good precision, but almost nothing is known about the actors themselves. In addition, the life duration of the actors is supposed to be short compared to the observation time. 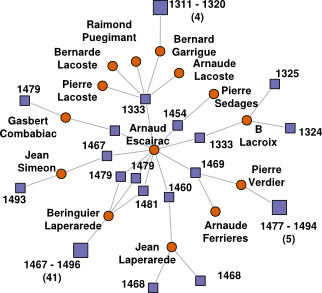 This is a typical situation for notarial acts under the feudal system in France, especially before 1500: actors are persons, mostly peasants for whom only the name is known, while transactions corresponds to notarial acts between lords and their tenants. Our first goal, addressed in a paper to be presented at ESANN'13 conference, was to estimate from such a timestamped (multi-)graph a central activity date for each actor. While a basic solution based on local averaging (the activity date of an actor is the average of the dates of the interactions in which he/she is involved) gives satisfactory results, we have introduced a generative model that outperforms it. Charles has started working on our next goal which is to bring robustness to the estimation procedure with respect to switching noise (i.e., transactions are sometimes wrongly assigned to an unrelated actor) and to degree variations (the current model assumes indirectly some form of uniformity in the number of transactions in which actors are involved). An example of a network with timestamped transactions with some noise.